Multimedia, performance and installation artist Sue Austin keeps a fascinating mission at the centre of her work: to challenge the idea of disabled as “other” and represent her experience as a wheelchair user in a brighter light. She does this by creating quirky, unexpected juxtapositions - bringing a sense of whimsy and empowerment to the discussion of disability. Austin is the co-founder and artistic director of Freewheeling, an initiative aiming to raise the profile and value of work informed by the experience of disability. In 2012, she was asked to be a part of the Cultural Olympiad in Britain, a celebration of the arts leading up to the Olympic and Paralympic Games. The work she created for the event, called 'Creating the Spectacle! 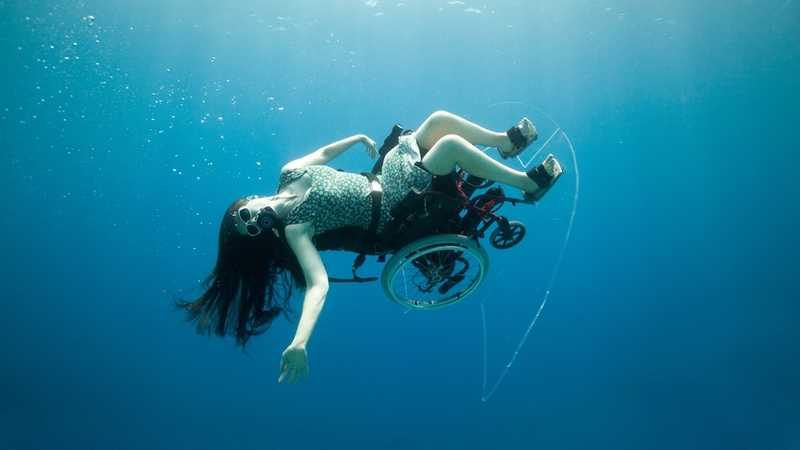 ', is a groundbreaking series of live art and video works of an underwater wheelchair. Since then the artwork has received international attention with Sue even being asked to speak at NASA, Stanford University and Monterey Bay Aquarium, reaching over 400 million people. Even though her artwork has reached so many people, Sue would say that each person that becomes aware of the underwater wheelchair and ‘Creating the Spectacle!’ has become part of the artwork too. Like nothing you’ve ever seen…. graceful, balletic and utterly beautiful. In October MAC will host a live link to the Adelaide Film Festival where Sue Austin will be performing live under water. The live link will be hosted in the First Floor Gallery alongside Sue’s installation. Join us for a unique opportunity to see Sue performing live!